Digital Divide Propels Barnes & Noble Past Rival Holiday sales at the bookstore chain's website were up 78 percent over last year; store sales increased by almost 10 percent. The company credited its popular e-readers, the Nook and the Nook Color, for the good news. Financially troubled Borders, meanwhile, is struggling for survival. Emily Fernandez, holding her daughter, Bethany, uses her Nook e-reader to browse books at a Barnes & Noble in Hackensack, N.J. The company on Thursday announced its best holiday sales in a decade and credited the Nook for the good news. The digital divide has created a chasm between the nation's two biggest bookstore chains: While Borders is trying to hold off bankruptcy, Barnes & Noble announced Thursday its best holiday sales season in more than a decade. "Thrilled" was the word Barnes & Noble Chief Financial Officer Joseph Lombardi used to describe the mood at his company. Holiday sales at BarnesAndNoble.com were up 78 percent over last year; store sales increased by almost 10 percent. While sales of hardcover books were better than expected, Lombardi made it clear that Barnes & Noble's popular e-readers, the Nook and the Nook Color, were behind the good news. "We made a big decision to invest a lot of money this year in developing the hardware and software that has become Nook, and we think we've done the right thing," Lombardi said. "And I think what this holiday season has proven is that our customers believe in us, and they believe in our product, and we've proven that we can do it -- and I think that's been the most satisfying thing coming out of this holiday for our company." James McQuivey, an analyst at Forrester Research, says the Nook is a popular reading device, but selling it at the chain's stores gives Barnes & Noble an added advantage. There's always a possibility of a resurrection here, but at this point, it looks like Borders is probably the Tower Records of books. "People buy the Nook at retail and then they go and buy digital books, but because they're in the retail location, they might pick something else up while they're there," he says. "So the good residual feeling that Barnes & Noble has after [the fourth quarter of] last year, it's all because of the foot traffic that the Nook drove. That's their salvation right now." While Barnes & Noble was developing the Nook, Borders was already having financial problems, leaving it ill-prepared to make the investments needed to meet the challenges of the digital age. Michael Norris, an analyst with Simba Information, says some of Borders' problems can be traced back to its leadership. "They've actually been through quite a few executives over just a short number of years, and every time there's been an executive change, it basically slows the company down," he said. "And it just hasn't been as nimble or agile as it should have been." Norris also says that Borders made a crucial error even before the onset of e-books. "For a lot of years, Borders actually relied on Amazon to handle their e-commerce function," he said. "So if you were to buy a book from Borders, you would actually be buying it on Amazon, and Amazon would pay Borders a commission. "So Borders didn't have experience developing its own infrastructure; so compared to Barnes & Noble, Borders really got off to a late start, making the online business and the offline superstore business work as one." 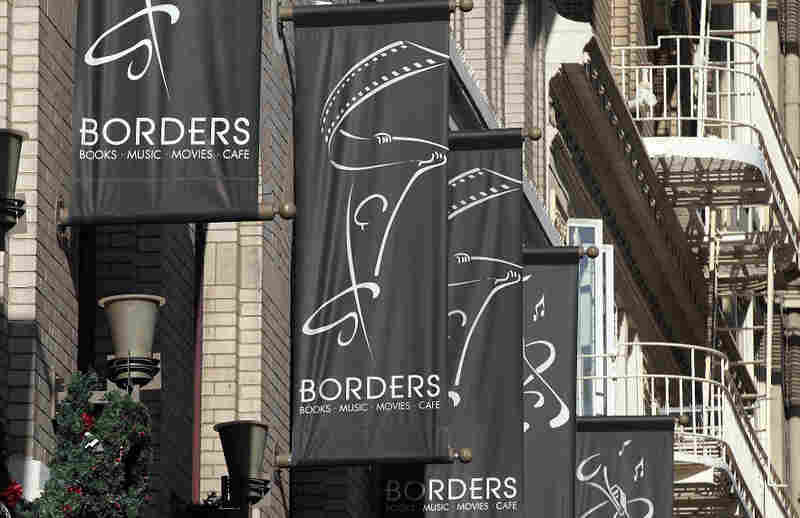 As 2010 drew to a close, Borders announced that it was looking for new financing and delaying payments to some of its vendors. Now, says McQuivey, Borders could go under. "There's always a possibility of a resurrection here, but at this point, it looks like Borders is probably the Tower Records of books," he said. "It's probably the book company most likely to go under, and to be that big announcement that causes everyone to finally realize that digital has won the battle." That's not to say Barnes & Noble doesn't still face its own challenges. McQuivey says once the digital-device market is saturated, a bookstore will still have to sell books. "That's the battle for the next couple of years: How do I get you to buy not just the best-seller on your Nook, but to buy a whole bunch of older titles that you weren't even aware of and weren't even thinking about? "That's what Netflix has done in video. It's what Amazon appears to be doing quite well in the Kindle world, and Barnes & Noble needs to do the same with Nook." While Barnes & Noble may lose one of its major competitors, it still has another: Amazon and its popular e-book reader, the Kindle, still dominate the e-book and online market.